Click here to open article on a separate web page. The downtown Vero bakery Freres Patisserie has just introduced a schedule of art shows there that is as toothsome as its pastries, says the café’s new co-owner, Bennet Gomez. “I feel very comfortable giving my wall space up to beautiful art,” says Gomez, who in his previous life in New York City worked in the art shipping business. 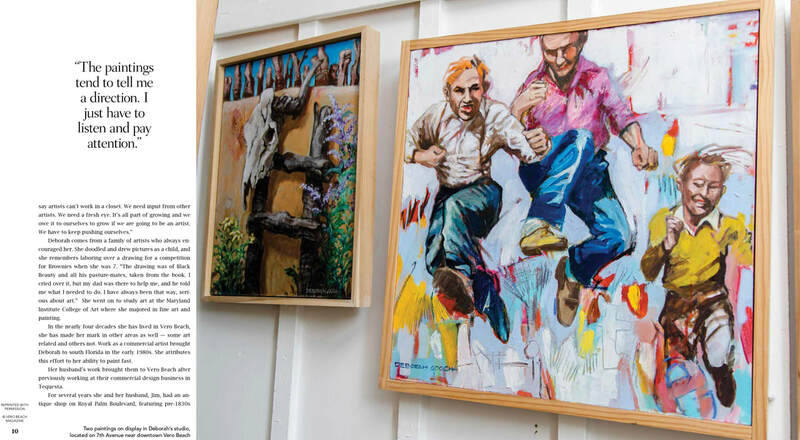 His 32-year career with Ollendorff Fine Arts saw him moving paintings and sculptures by the blue-chip likes of Andy Warhol and Jeff Koons, among others. But that was then; this is now. Don’t expect to see New York City art stars on Freres Patisserie’s walls. 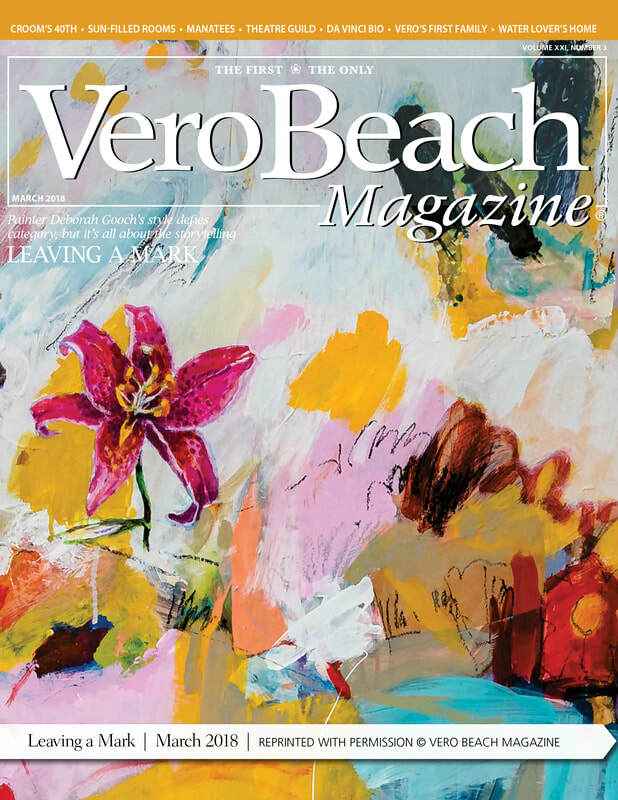 Still, Gomez feels “very fortunate” to be presenting the work of Vero’s artists, many of whom were patrons of Patisserie Vero Beach, the bakery’s first iteration, owned by two former New York actors, Mark Edmonds and Christian Garcia. When Edmonds died suddenly in February at the age of 47, Garcia decided to sell and enlisted the help of longtime friend and Vero artist Barry Shapiro. It is Shapiro who is curating the art shows at Freres Patisserie. He says the series will consist of solo exhibitions, all lasting two months. On view now through September are nine works by Deborah Gooch, a well-respected artist and educator who is recovering from a serious health scare of her own: a brain tumor that while benign still required complex surgery and radiation. 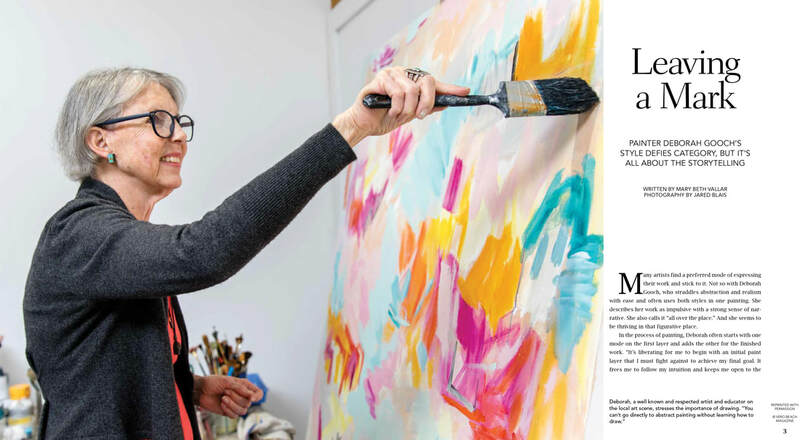 Back at the easel within weeks of her surgery in early April, Gooch is displaying in her paintings the dynamic mix of realism and non-representational abstraction for which she has long been admired. Her work, says Shapiro, typifies the “high creative level” that art-loving noshers can expect of the café’s subsequent offerings. After studying painting at Baltimore’s Maryland Institute of Art, Gooch established herself as a freelance illustrator and commercial designer. She worked first in Maryland and then in Florida, where she and her husband Jim have lived for the past 30 years. 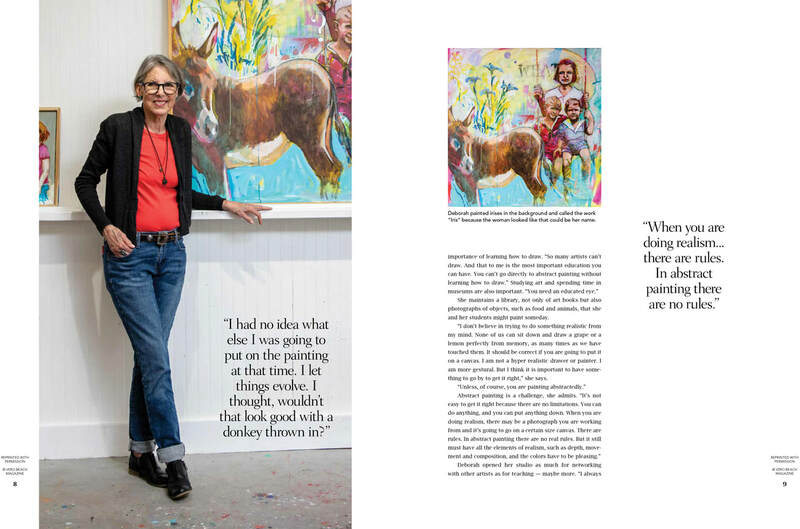 Today Gooch considers herself above all a contemporary painter; her busy studio and gallery is located on 7th Avenue, just west of Vero’s Miracle Mile. For this exhibition Gooch’s paintings are not titled but numbered, the numbers on the wall next to each artwork corresponding to on-site checklist of price and size. 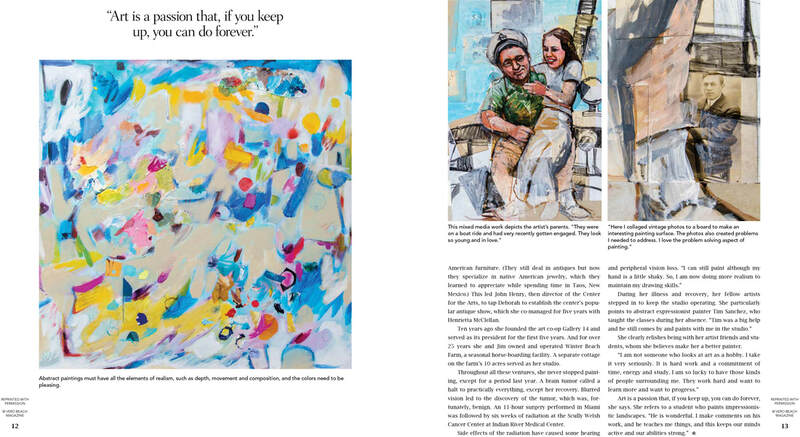 Among the show’s abstracts are two paintings in which the human figure takes center stage. One shows a runner balanced on the picture’s lower edge, foot upraised as though to step right out of the painted boundary. Behind the runner, and bearing no relationship in scale either to the figure or to each other, a disembodied goat’s head, a watermelon wedge, and a recumbent dog float in a pale miasma. 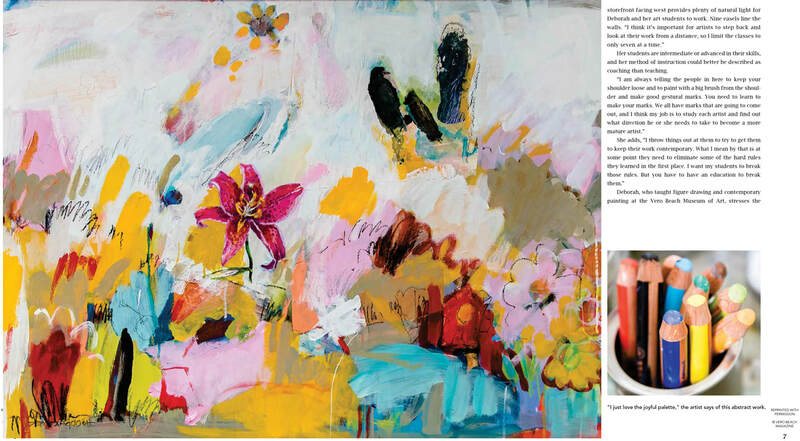 Various drips, scribbles and bursts of pink and yellow pigment add a juddering energy to the mix. At 48 inches high and 60 inches wide, the lone nonrepresentational picture on display is also the show’s largest. In it, a freely drawn composition of colorless circles and squares dance and duke it out with a host of brushy squiggles atop shifting fields of blue and yellow-gold. Shapiro’s favorite in the bunch is Gooch’s 42-inch square canvas #5. The trapezoidal shape that dominates the composition can be read as the tipped-up plane of a floor or tabletop. It is weighted with colorful brush marks, smaller trapezoids, and circles that sometimes turn into fruits: specifically, a half cantaloupe, a peach, and a green apple. Shapiro, sipping a latte at a table beneath that painting, talks about Gooch’s health ordeal, something many in Vero’s intimate art community already know. “I was very excited to have Deb agree to have the first show here, because I didn’t know if she would have the energy for it,” he says. Two miles away, at work in her studio, Deb Gooch laughs on hearing Shapiro’s concern. “I think that Barry was just hoping I’d be alive long enough to get it done. Everybody wonders what’s going on with me,” she says. The first symptom Gooch noticed was double vision four years ago. Perhaps the scariest part of her illness was the memory gaps. “I didn’t even know when I’d had one,” she says. “One day I was driving west from the grocery store on 12th Street to my house, and I ended up going 8 miles past my turn-off. I had no concept of where I was, or what I was doing. “That was pretty close to the time that I found out I had the tumor,” she adds. Gooch saw several physicians over the years hoping to find the cause of her symptoms, but she did not receive a diagnosis until late March of this year. The discovery of a brain tumor was ancillary to her treatment for another illness. Gooch’s surgery in Miami lasted 11 hours. When she awoke, her first thought was whether she would paint again. The answer was a resounding yes. In addition, Gooch was thrilled to find that her studio, where she regularly provides critique to a following of advanced painters, was still humming. “All the people who had been coming here kept coming here,” says Gooch. Tim Sanchez, a prominent abstract painter in Vero and a close friend of Gooch, made sure that her classes continued without break during her two-month absence. “Tim wouldn’t let me pay him, and he was in here every day,” Gooch marvels. The first painting Gooch did after her return is a 24–inch square canvas whose bold, black passages are counterbalanced by areas of cold, bright pink. A small pear penciled near the composition’s center affirms Gooch’s continuing interest in the fruit- and flower-infused abstract series she was working on in the months before her surgery. Freres Patisserie is at the corner of Old Dixie and 9th Street in downtown Vero Beach. 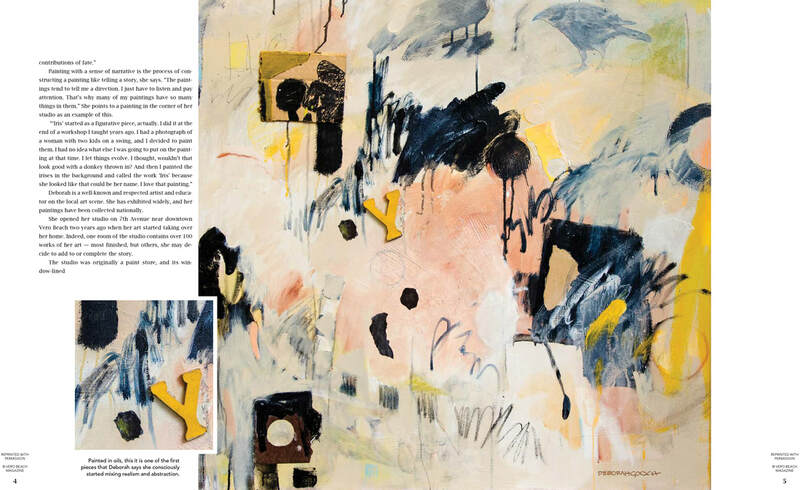 There are many ways to look at the less abstract paintings of Deborah Gooch. On one level they are irrepressibly charming. Her children area hundred years from Mary Cassatt's, all scraped knees and torn jeans, exploding with the energy of their age. Her grown-ups can be cantankerous, but their eyes are even more likely to twinkle. Her animals seem closely rendered:Her whippets have the character of classical Greek casts. And don't even think about messing with her crows. At this level - and it is perfectly reasonable to enjoy these works exclusively at this level- they are the epitome of what is often called figurative painting. But that's not what Gooch calls the, She quite carefully refers to them as "figural". It's more than a semantic difference. The ideas for her subjects may be sparked by old photographs (which she loves) or by deeply rooted memories (which she nurtures). But as she paints, the images and the memories morph into something beyond themselves She is no longer producing disarming representations of living creatures .She is producing emblems. Her figures come to embody abstract concepts of moments in time, moments in nature, and most intensely, moments in Gooch's own personal history. In that sense,they can be read as a diary of her odyssey, a journal of the way she has tacked through her life. And because her creatures are so intensely a part of her psyche, they crop up even in her abstractions. There are times, she says, that "no matter how happy I am with an abstraction, it will not seem complete, not seem grounded, until one of them appears".